Easy Chinese style cabbage stir fry with garlic, green onion, ginger, dried pepper and Sichuan peppercorns. This is one of the most common easy stir fry dish on my table- Chinese style spicy and sour cabbage stir fry. The Chinese name for this easy cabbage stir fry dish is hand shredded cabbage. You many wonder why it should be hand shredded? Not cutting? Hand shredding can help to remove the tough part of the cabbage and further making preparation for later quick frying. Quick frying can remain the crispy taste of the cabbage. If you happens to have Sichuan peppercorn and black vinegar at home, this is really a must try dish. Making this at home is so easy but it comes out super great and yummy. Easy Chinese style cabbage stir fry-hot and sour in taste. Hand shred the cabbage and drain them completely. Prepare other seasonings. Heat up oil in wok over medium fire, add garlic, white part of green onion and ginger, fry until aroma. Add dried chili pepper and Sichuan peppercorn too to fry for another 20 seconds. Turn up the fire and add drained cabbage. After that, add salt, soy sauce and vinegar immediately. 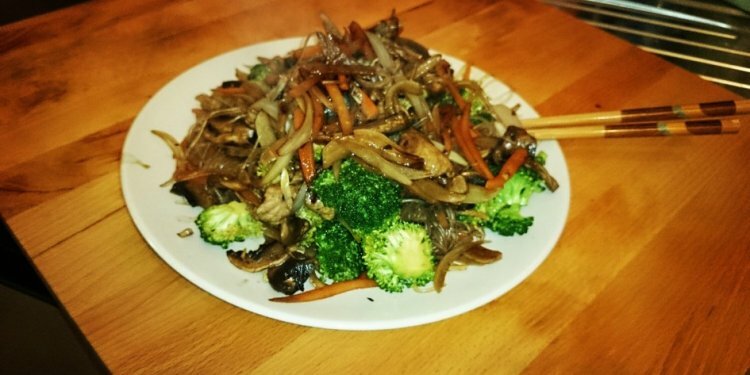 Do a quick stir fry for around 1 minute. Remove from fire and add green onion section. Mix well and serve hot! You can also add some protein in this recipe like bacon, pork belly or sausage. In order to make sure that the flavor is well absorbed by the cabbage, drain the leaves completely before frying. What can you substitute for hoisin sauce in a recicpe for char siu roast pork?